Was it a meaningful movement or just noise? 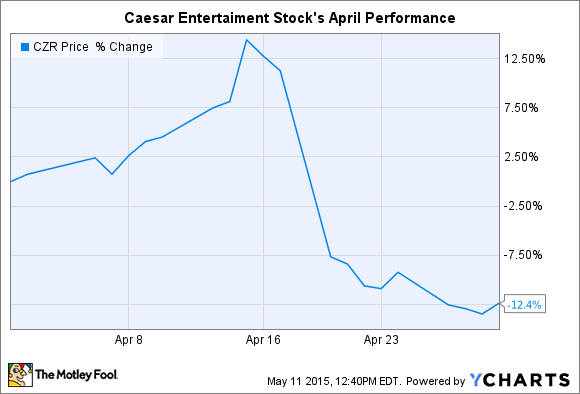 What: Caesars Entertainment (NASDAQ:CZR) stock dropped 12% in April, according to S&P Capital IQ data. So what: Investors sold off shares after the gaming company announced it has so far failed to reach agreement with creditors on restructuring its crushing $18 billion debt load. The company in December said it would work with its bondholders to lower the burden to $9 billion while reducing annual interest expenses from $1.7 billion to $450 million. But Caesars needs its bondholders to agree to the plan for that happy result to play out. That hasn't happened yet, and time is running out before the company loses control over the exact terms of its bankruptcy dealings. Now what: Caesar's first-quarter report filed last week showed encouraging improvement in some areas of the business. For example, its online gambling segment booked a 42% revenue gain and 101% improvement in profits. Cost reductions also boosted overall earnings. However, investors still don't know what the final details of the bankruptcy reorganization will look like, or even when that plan will be reached. Until then, the next date for shareholders to watch is May 27. That's the court-mandated deadline for Caesars to reach common ground with its creditors on the company's restructuring.